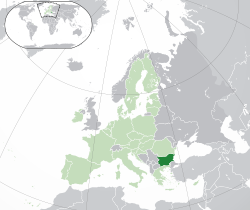 Rwiyo: Мила Родино, "Dear Motherland"
Bulgaria (/bʌlˈɡɛəriə/ muChiBulgarian: България [bɤ̞ɫˈɡarijɐ]) inyika iri muEurope. Nyika iyi ine miganhu neSerbia, Romania, Macedonia, Turkey neGreece. This page was last edited on 1 Zvita 2013, at 13:12.